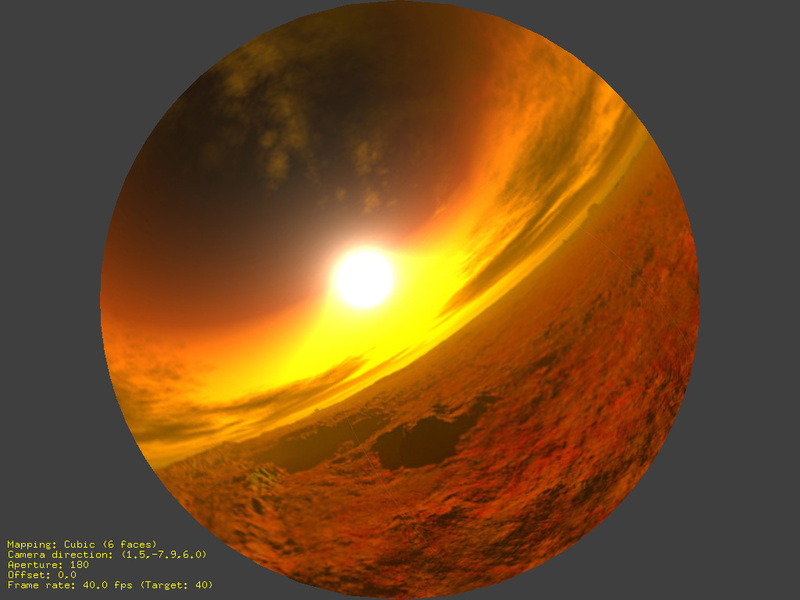 See also: Interactive fisheye image generation for details on the algorithm used to create the projection interactively using hardware accelerated graphics hardware, namely using OpenGL. Featured first at BOK GLOBULE at Burning Man 2004 (August 30 - September 6th), a 30 foot geodesic dome theatre constructed in celebration of the 2004 theme: Vault of Heaven. Most people are familiar with interactive viewing of panoramic images using various software products, originally popularised by QuickTime VR from Apple. 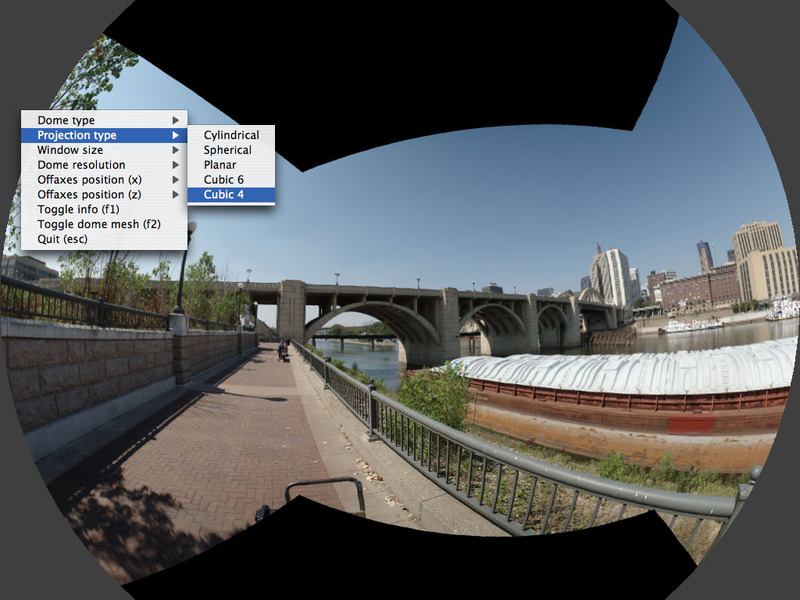 These calculated a perspective rectangular window from spherical panoramic, cylindrical panoramic, or cubic images. 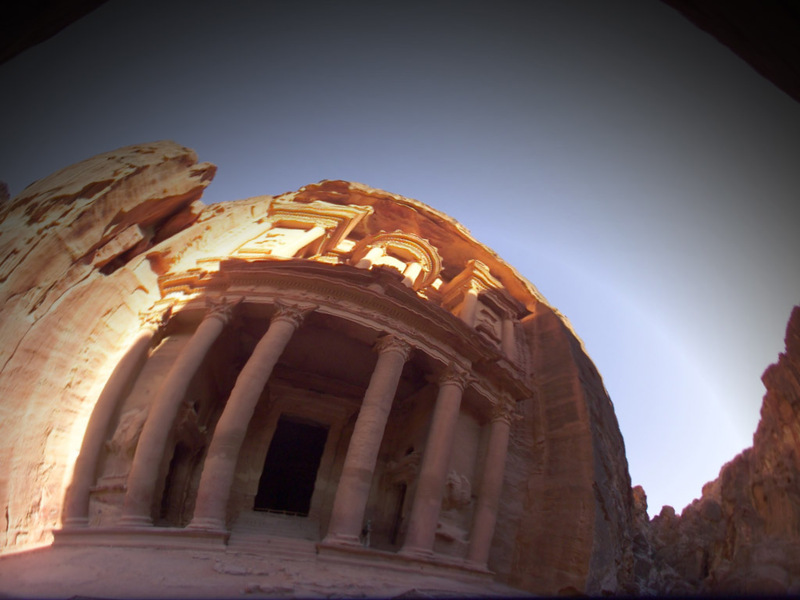 They typically allow the user to rotate the view direction of the camera and zoom in or out, all in realtime. 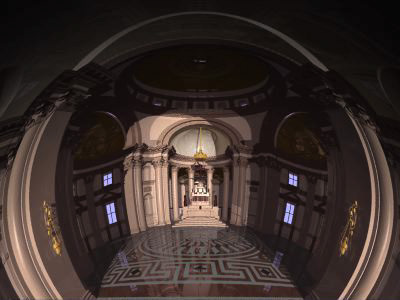 This demonstration application performs the same function except that instead of presenting a rectangular perspective output, it creates a angular fisheye image suitable for projection into dome environments. 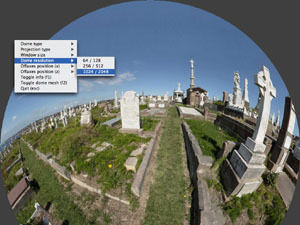 There are 3 widely used geometries for surround visual fields, they are spherical panoramas, cylindrical panoramas, and cubic environment maps. All are supported here along with some variants, they are each illustrated in the text below. 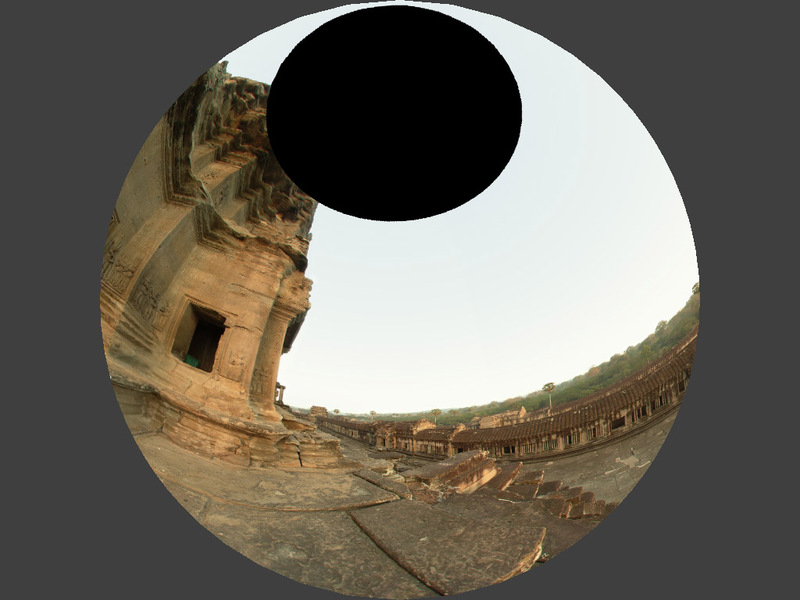 There are additionally a number of ways of aligning the angular fisheye image (which is circular) within the rectangular region of the projector, typically with a 4:3 aspect ratio. The majority of panoramic images extend 360 degrees in longitude but are typically restricted vertically. This is often not a great loss for a perspective projection and the vertical navigation is often limited so the user doesn't "look" too far up or down. 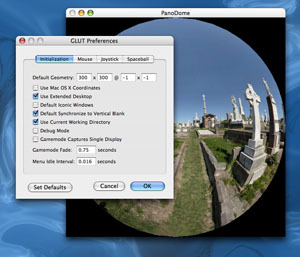 In this implementation the user is free to look anywhere, the areas in latitude not included in the panoramic image are displayed as black. Unlike the cylindrical panoramic image, the spherical typically represents the entire spherical field, 360 degrees in longitude and from -90 (South pole) to 90 (North pole) degrees in latitude. 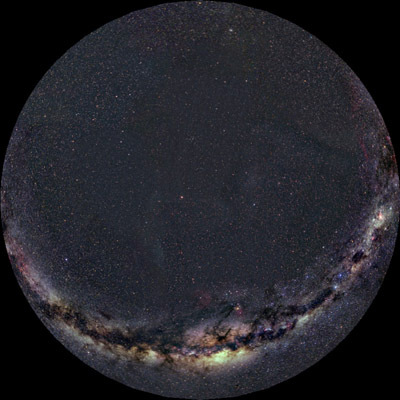 There is a singularity at the North and South poles where those single points in 3D space are stretched along the entire top and bottom edge of the spherical panoramic image. This and the spherical panoramic input image type are the two environment maps that support a full spherical navigation. 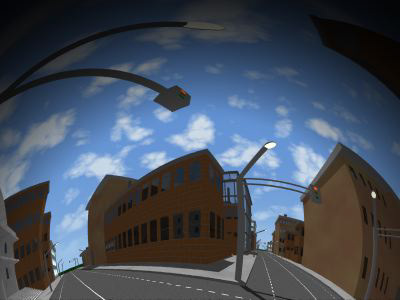 While the spherical option is more suited to real world filming options, the cubic environments are more suited to computer modelled/rendered environments. Computer rendering applications don't always support fisheye or panoramic projection but they all support 90 degree square perspective projections. Note: the configuration of the input image on the left. The bottom face of the cube is placed in the top right hand corner but it is aligned in such as way that it's "natural" position is below the "front" image. This input image just consists of the 4 faces of the cubic environment, that is, the top and bottom faces are missing. As with cylindrical panoramic images, the areas in the dome that correspond to the top and bottom faces of the cube are shown in black. 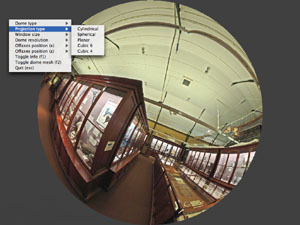 While a fisheye image doesn't contain the entire field of view of some of the other image formats, this option does at least allow one to spin a fisheye image around within a planetarium. The lower hemisphere will just appear black, use the middle mouse for a rotate, the "[","]" keys, or auto rotate with "b", "B". There is a "view up" option in the menus that may also be useful for orientating the camera correctly. At the time of writing the application has been developed using Mac OS-X but just as a UNIX application, it therefore also builds straightforwardly under Linux. Because the input image is recursively bisected so they can be more efficiently applied as textures, the input image width and height must be a power of 2. Typically one scales the image width to a power of 2 (eg: 4096 pixels) and then crops or pads the height so that it is a power of 2. At the time of writing the maximum size image that can be handled and still achieve smooth interaction is roughly as follows. Width: <2048    Almost any graphics card today can handle this. 4096    Requires better than average cards. >8192    Requires the better cards on the market. Options are available through the menus (right mouse click). 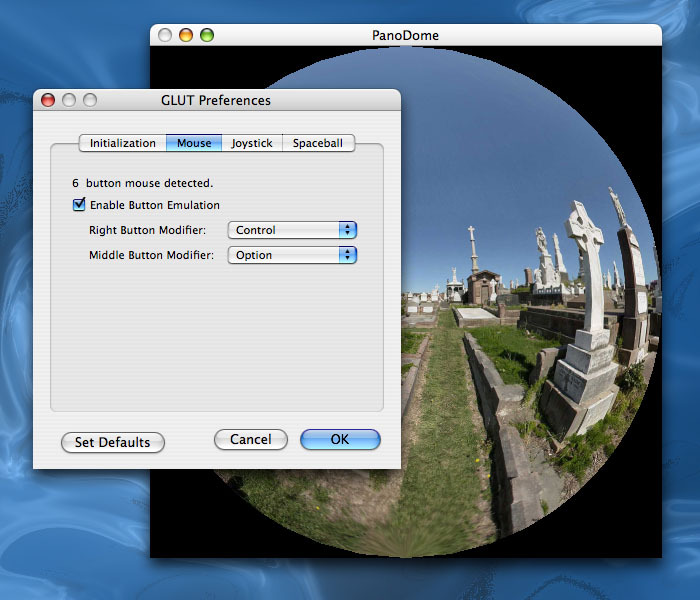 For Mac users with a single button mouse see the GLUT preferences for button emulation, normally control-click for the right button and option-click for the middle button. In the majority of practical uses (fisheye lens or spherical mirror) it needs to be run in full screen mode. This is generally not a problem for Mac OS-X but it can be an issue with many/most Linux based window managers and most implementations of GLUT for Linux. In particular, the release versions of OpenGLUT and FreeGLUT seem not have problems, the original MesaGLUT seems to implement fullscreen mode properly. 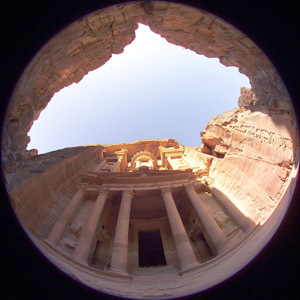 Spherical panoramic images are assumed to extend from -90 to 90 degrees in latitude. 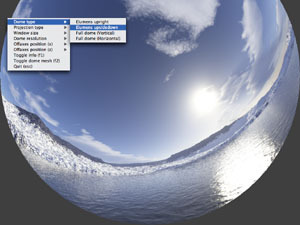 The latitude range for cylindrical panoramas is derived from the width to height ratio of the image and is assumed to be centered about equator (0 degrees latitude). Currently 4 views are rendered internally and the resulting textures mapped onto the appropriately textured fisheye disk. 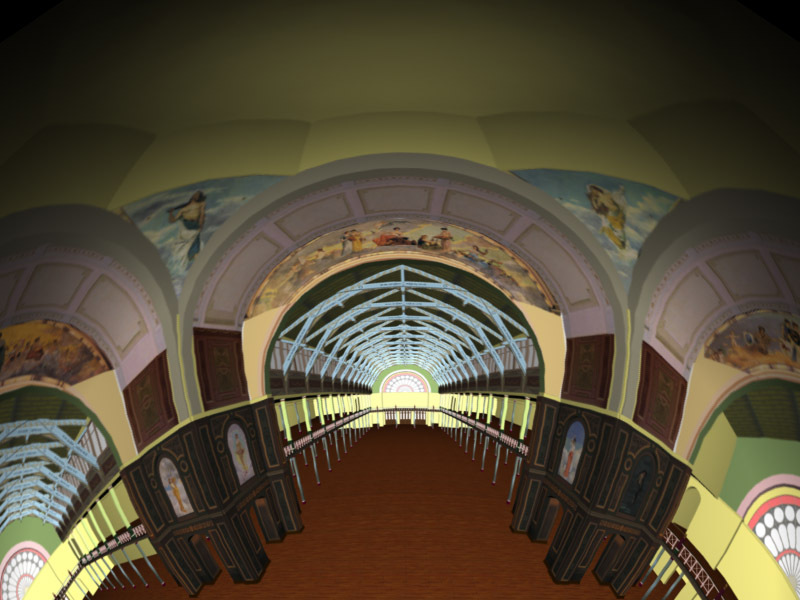 4 views are required for the full dome option but only three views are strictly required for the two truncated dome projection options. A further 25% performance increase could be achieved if one wanted to optimise for a truncated dome arrangement. An attempt is made to handle different projector aspect ratios, however, there is no assurance that the way your particular lens is aligned with the rectangular projector image is replicated identically by this software. The input image must be either a 24 or 32 bit TGA file, compressed or otherwise. Other file formats can readily be added in the future. Fisheye window dump from high resolution spherical panoramic images from Dr. Axel Mellinger, Universitaet Potsdam. 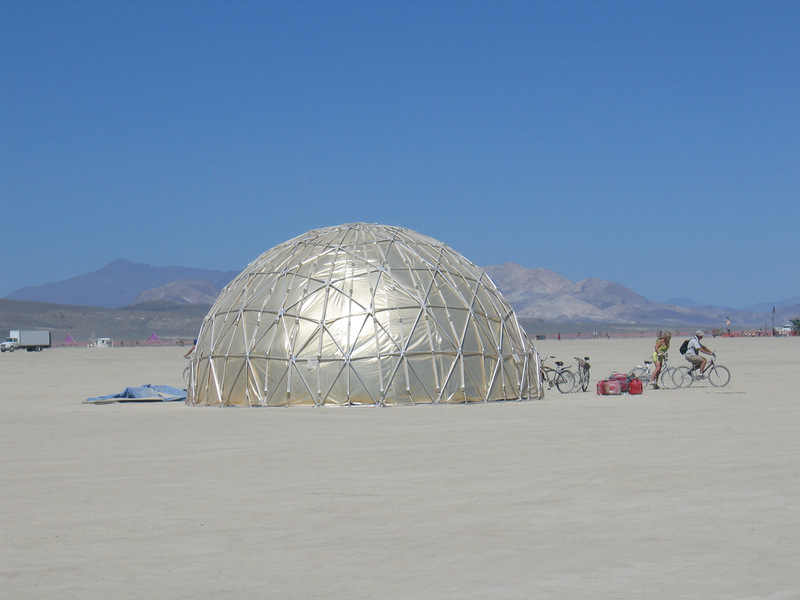 First public appearance of panodome, Bok-Globule at Burning Man 2004, Courtesy of David McConville, The Elumenati. 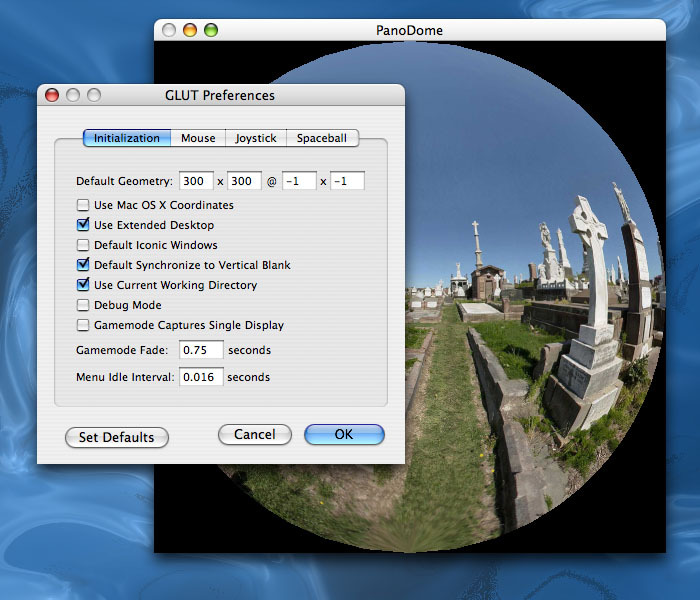 To set the GLUT preferences (permanently) for Mac OS-X, run panodome (or any GLUT based application) in windowed mode (don't use -f). Choose preferences and perhaps set them as follows. Quit from panodome, all GLUT based applications will use these preferences from now on.